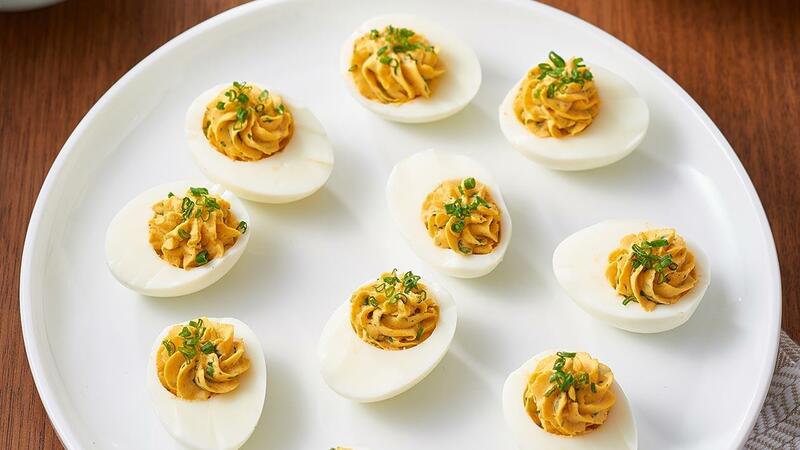 These curried devilled eggs are simple to make with ingredients you are likely to have in your kitchen. The addition of KNORR Patak’s Mild Curry Paste and HELLMANN’S Real Mayonnaise makes them extra creamy. Hard boil eggs, then cool. Remove shells and cut eggs in half. Remove the yolk from each egg and mix together with KNORR Patak’s Mild Curry Paste, HELLMANN’S Real Mayonnaise, water and herbs. Spoon or pipe mixture back into the eggs. Garnish the eggs with a little extra of chopped chives and serve with salad or steamed vegetables.